Marne La Valle, France — It’s officially on the course: on July 10, 2014, Disneyland Paris unveils a new world dedicated to the Disney•Pixar film Ratatouille. Named La Place de Rémy in tribute to the “little chef,” this all-new mini-land will open in Walt Disney Studios Park and will feature a completely original attraction, inspired by Rémy’s adventures in the film. 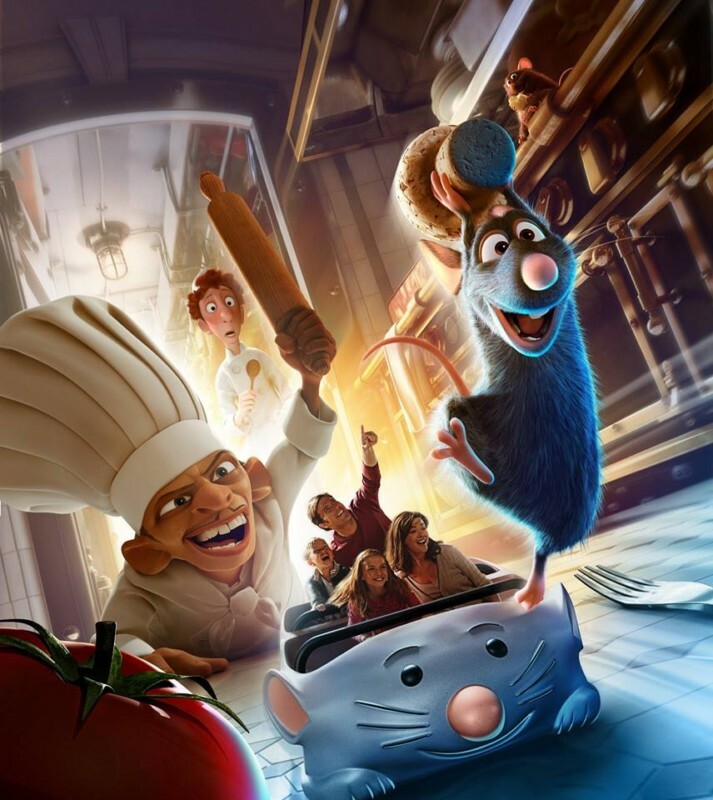 The all-new attraction, the 60th to open at Disneyland Paris, is called Ratatouille: L’Aventure Totalement Toquée de Rémy (Ratatouille – The Adventure). Guests are shrunk down to the size of a rat and board “ratmobiles” for a zany culinary adventure through Gusteau’s famous restaurant. From a Paris rooftop to the restaurant’s bustling kitchen, cavernous food locker and busy dining room under the careful watch of Chef Skinner, this adventure is full of twists and turns. Ratatouille – The Adventure welcomes guests to La Place de Rémy, a corner of the park’s Toon Studios that has been transformed into a Ratatouille-inspired version of The City of Light. This brand new mini-land, exclusive to Walt Disney Studios Park, also features Bistrot Chez Rémy, a table service restaurant serving, among other delicious dishes, the little chef’s famous ratatouille in a larger-than-life setting. A special boutique, Chez Marianne – Souvenirs de Paris, will also open its doors in Autumn 2014. Released in 2007, Ratatouille , which won the Oscar for best animated feature film, tells the story of Rémy, a rat who dreams of becoming a renowned French chef. Filmgoers got to know Rémy in an adventure that took him to the top Paris restaurants. With the arrival of Rémy at Walt Disney Studios Park, guests will find themselves in the middle of his exciting culinary adventure. Ratatouille – The Adventure is a first-of-its-kind Disney attraction that features trackless ride vehicles matched to enormous 3D projections of original animation by Pixar Animation Studios. The attraction brings together imagination and technical know-how, the hallmarks of Walt Disney Imagineering, creating a state-of-the-art storytelling experience. The crazy culinary adventure begins 10 July 2014 , exclusively at Walt Disney Studios Park, Disneyland Paris. The culinary world of the Disney•Pixar film Ratatouille comes to life in Ratatouille L’Aventure Totalement Toquée De Rémy (Ratatouille – The Adventure), a first-of-its-kind Disney attraction that uses trackless ride vehicles matched to an enormous 3D projection system featuring original animation from Pixar Animation Studios. Guests shrink down to the size of a rat and join Rémy, the “little chef” from the film for a crazy culinary adventure that sends them scurrying through the kitchen, dining room, and walls of Gusteau’s famous Paris restaurant. The adventure begins when guests come on board a “ratmobile”, a vehicle that looks like a cute version of our furry friends from the film. Soon the ratmobiles are on a Paris rooftop where they encounter Rémy and the ghost of chef Gusteau as they discuss the special meal Rémy wants to prepare in guests’ honor. Moments later, Rémy’s excitement leads to him and the ratmobiles plummeting down to the kitchen floor of Gusteau’s restaurant. Being rats in a human world is fraught with danger, so Rémy and his new friends in the ratmobiles quickly move out of sight before Chef Skinner spots them. Rémy leads the way as all of the rats move from one hiding place to another. Luckily, Rémy’s human pal Linguini is there to help. Welcome to the ratmobile! Specially designed by the Imagineers, this amazing car comes in five colours and holds six passengers – great for the whole family. The ratmobiles travel in groups of three, but none follows the same route. They move using a technology that requires no rails. Now guests can really experience what it’s like to be a little creature in a human-sized world as they dart quickly from hiding place to hiding place during this zany culinary adventure. The new attraction, Ratatouille – The Adventure, will be located in a new area of Walt Disney Studios Park called La Place de Rémy in honour of the energetic “little chef” from the film and the city he loves, Paris. This new mini-land pays tribute to the real City of Light while at the same time evoking the whimsical Paris seen in the film. Also on the Ratatouille-inspired menu is a restaurant, Bistrot Chez Rémy, with a similar atmosphere and proportions to the restaurant experienced at the end of the attraction. Completing the mini-land, and arriving in the autumn, is a new boutique, once again paying tribute to France: Chez Marianne – Souvenirs de Paris. The Paris of Ratatouille draws inspiration from several iconic neighbourhoods of the City of Light. Place Dauphine and Boulevard Haussmann particularly influence its architectural design. The colours of building façades and the entire neighbourhood are purposefully more intense than real-life Paris. 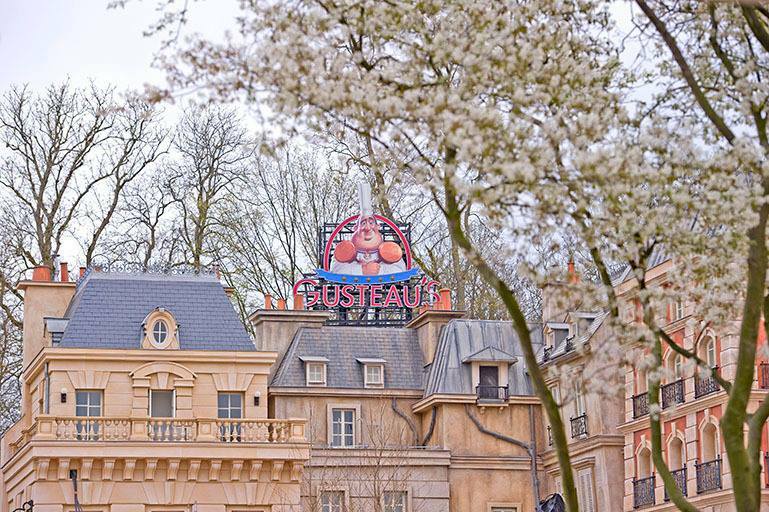 When creating the attraction, the Imagineers chose the Paris of the Ratatouille film world, which pays homage to the City of Light. The vitality of the film is completely preserved. One of the most important elements of La Place de Rémy is its fountain. Filmgoers saw a typically Parisian example in front of Gusteau’s restaurant in the film. To recreate it in the Park, the Imagineers studied many Parisian fountains. The inspiration for our fountain was found in Place des Vosges, with its circular basins and lion heads spouting water. Once the shape and dimensions were decided, the designer Harley Jessup, who worked on the film Ratatouille, personally added the finishing touches that make reference to Rémy, his rat friends and the kitchen. Gourmet rats hold up sculpted bottles of freely flowing champagne. La Place de Rémy will include two main streets: Allée des Marchands and Rue Auguste Gusteau. A tribute to the world’s greatest chef, Paul Bocuse, who provided plenty of inspiration for the creators of Ratatouille, will be unveiled on the central square near Bistrot Chez Rémy. The lampposts and benches will also be typically Parisian. Thanks to all these elements created by Disney’s Imagineers, guests will be able to stroll through Paris as it appears in Ratatouille. Fans will also be able to spot references to the film, such as Linguini’s bicycle, Colette’s motorbike or the Vespa stolen by the dreaded Chef Skinner. Delicious French cuisine, like that presented in the Disney•Pixar film Ratatouille, can now be enjoyed by all in Bistrot Chez Rémy, a themed table service restaurant inspired by the world and recipes of the film. The upscale, but light-hearted 370-person restaurant is the creation of Rémy, the rat who loves to cook, and is located in a new corner of Walt Disney Studios Park that’s been transformed into a Ratatouille-themed version of The City of Light. Join us for lunch or dinner at Bistrot Chez Rémy from 10 July 2014. 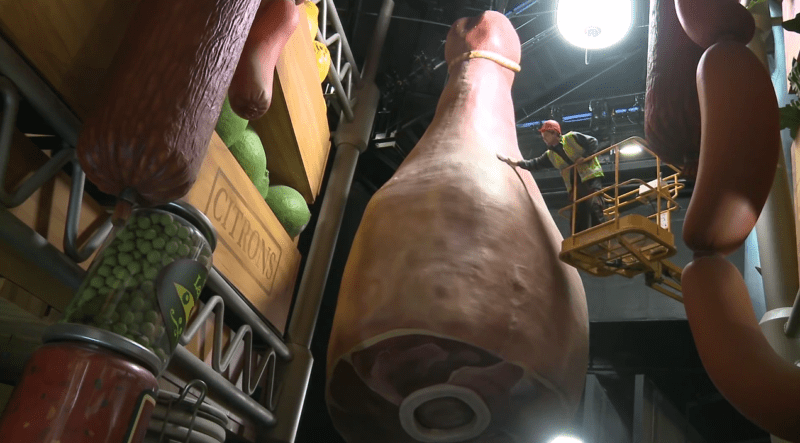 Bistrot Chez Rémy will welcome guests into an oversized world in which they are shrunk to the size of rats and where jam jar lids serve as table tops and champagne corks are turned into chairs. Designed by Rémy and his friends, the restaurant also features larger-than-life items like paper cocktail umbrellas turned into parasols, giant cookbooks standing on end, and plates used to separate seating areas. On the menu during this Ratatouille-inspired experience, Rémy has prepared a unique menu that includes entrecote, chips and of course, ratatouille! The “little chef” recommends a seasonal salad to start and a choice of dessert: a selection of French cheeses, including Brie de Meaux, and a fruit salad. Bon appétit!